Bonus bag for pre-ordering pieces. Kinda want. pieces store bonus, colored. Or some of them. I’L 2019 Winter. Tapestry incoming as usual, I guess. KeroQ/Makura Denkigai. Nothing particularly interesting? feng’s vaporware seems to be progressing? Riddle Joker C95 from Toypla. Recycled CG. Probably upscaled. More Toypla, this one is Senren Banka. Kinda want Mako and Murasame. Recycled from 2018 calendar. Mashimaro pillow cover. Seems a bit weird? 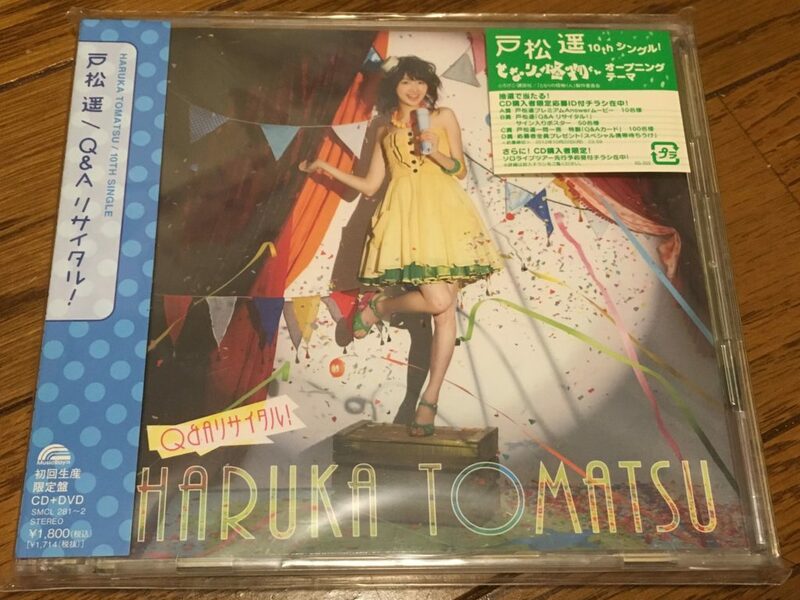 Sonora limited edition bonus now includes various fanbooks. New light novel drawn by sune with bonus tapestry. Title is “Isekai shoukan sareta ore ga H dekinai riyuu”. I believe it’s all ages despite the title and description. Cuffs 2018 Winter. 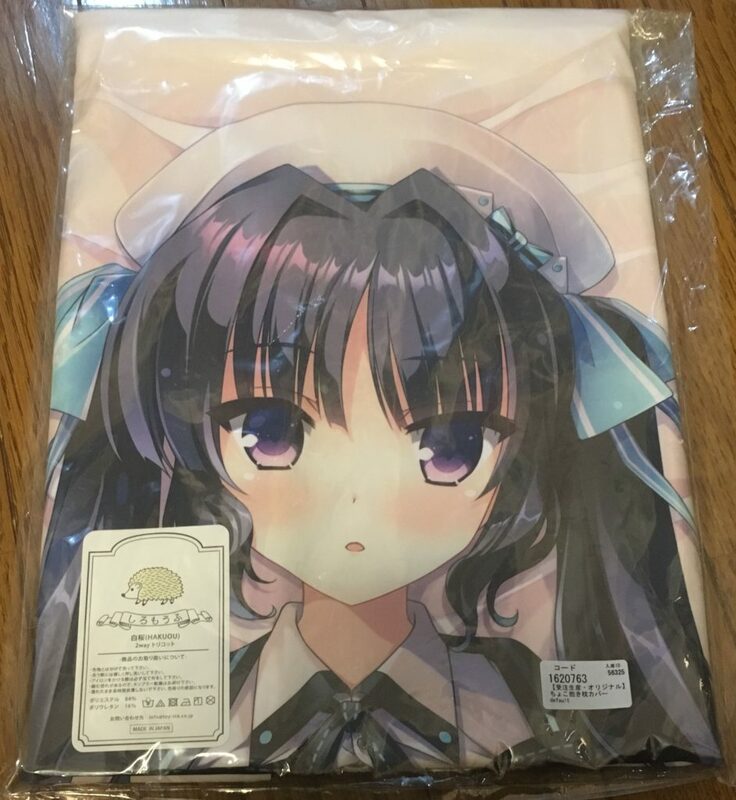 More Kurano Tomoka pillow cover! Wut. Also more Sena cover. That wasn’t expected. Are we getting more Ema? Perfect anime for Christmas: School Days. Random old single. For some reason started listening to this again. Comiket catalog! And the accompanying artbooks. Not really exciting though unfortunately. There’s maybe like 10-ish relatively interesting illustrations. New pillow cover woo. The other mascot girl of A.M.R. – Choco – with the same “standard” as the previous one. Very old doujinshi by Muririn and Kobuichi. You can tell which one is which just by looking if it’s still in sketch form or not. I was confused by it years ago when I first bought their book but apparently that’s just how they operate. At least if they improve it if they’re selling it later at stores. That also caused me to buy multiple copies of same book. The thing is they don’t always sell it later at store I still need to buy it at the event just in case. And the last stuff is Melonbooks catalog tapestry illustrated by Kanekiyo Miwa. It’s uncensored. Still with relatively weird coloring just like the one from previous Comiket. I like the composition for this one better though. We’ll see whether I end up keeping this one or not. Slowly going through Nanao route. Way slower than I hoped. Should make some good progress next weekend because I don’t have anything much planned. Finished the event, now grinding for the box. All the bones. Sold quite a bunch of stuff from YJA last week. The profit is -35%. Whoops. At least it’s something. Put a bit more stuff up. Hopefully this week will go well again. Got slightly a bit more tax refund this year so yay. A bit less than I hoped but nice regardless. Old apartment, on other hand, I had to pay for floor repair/replacement because apparently I damaged it quite a bit thanks to weather. Dunn dunn. I think I ended up with -10k. While at it, stock is going down the drain and I’m closing in to -100k. RIP me. On the bright side buying more funds will be cheaper around this time. …unless it just keeps going down. Anyway, I’m still mostly in the moving in mood and need to sort a bunch of things. I have barely set up tapestries correctly. I can hang up quite a bit more B1 now (or just about the same amount of B2). The storage is smaller so I really need to sell way more tapestries. And pillow covers – which may end up with something like 50%+ Ikegami Akane as I mentioned before. Additionally I have to scrap a bunch of eroge boxes so I can store my clothings. Or maybe just scrap them. Talking about scrapping things, I haven’t disposed my soon-exploding phone. Though now I think about it, bringing it to repair shop may work as well if they can handle it. I’ll check it this weekend. I haven’t started looking at reconfiguring my computers. Current goal is just to have one PC (and some laptops) at office and two PC at home. I need to either sell the extra PCs I have or the other option. After I thought a bit more about it, I don’t know how can I store all my stuff even if I sold like majority of my tapestries. Doujinshi is another major space eater and I’m not still not quite sure how to store them “safely”. There’s also a bunch of anime blu-rays which may end up with same fate as eroge boxes. I don’t know yet. At worst I’ll have to get a storage room. It’s already bad in my previous place and now it’s kind of even worse because there’s not much space outside the main room so despite the better layout, it doesn’t quite feel like more space. Yeah, I don’t know. There’s one storage room nearby and costs about 7k monthly for 500 liters room. That will also allow me to store the stupid ceiling light which came with the room and I replaced with my remote-controlled LED light. So, yeah, that may be a thing. I’ll try crapping out more stuff first before giving up and pay for the storage. On wasting money, I’ll be buying some Cuffs (and not Cuffs) stuff and then a bunch of winter events stuff as usual. Still not sure on Minato pillow cover. I really need to cut down on it so I don’t know about that one. There isn’t any interesting stuff came up yet. I think. There are some books which I mentioned before and oh right official Okita (FGO) tapestry. I’m still not sure on Whirlpool calendar because I think I have at least two Moeoh calendar. And maybe even Ikeaka calendar. And then Riddle Joker calendar. Calendars, calendars everywhere. If I do manage to only spend 90k for the events and all that craps, I’ll be 400k off my savings target. Which means I should have reached the target had I not moved here. It’s nice here though. Way more strategic than the previous one. Also it’s fancy. Right, there’s that cheap phone which didn’t work quite right I bought last week. The guy replied and then not anymore once I tested a bit more and asked for refund. He told me to wait a few weeks for the fixes. Yeah that’s not happening. I hope Amazon doesn’t make it more difficult for me. Should be fine. I think. Which means I will have extra 20k budget for that off-target target (?). Lol. Actually a bit more because someone already bid one of my stuff. Unfortunately no auction next week because it coincides with new year a bit too much. The auction will resume first week next year and hopefully with way more stuff. One day late because I watched Fantastic Beast which is barely about beasts and I haven’t watched the first one. That was smart. Though apparently it’s not quite related to the first one? Anyway, I need to clean up my kitchen and myself and go sleep ASAP. I haven’t slept properly this last few days.